VATICAN CITY (CNS) — The rise in populism, the challenge of vocations in the church and the need for a personal sense of humor in the face of criticism were among the topics Pope Francis discussed in a new interview with Germany’s Die Zeit newspaper. 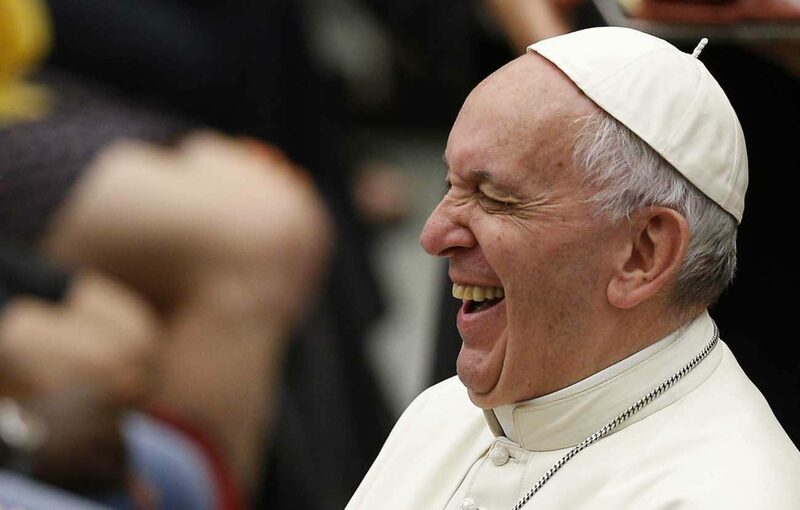 “There is this prayer — which is attributed to (St.) Thomas More — that I pray every day: ‘Lord, give me a sense of humor!’ The Lord preserves my peace and gives me a great sense of humor,” Pope Francis said. Vatican Radio released a brief summary with selected quotes from the nearly 6,000-word interview, in which the pope discussed several issues and events. Among the topics he touched on in the interview included the shortage of priests and the possibility of female deacons. “The call for priests represents a problem, an enormous problem,” especially in Germany and Switzerland, he said. “The problem is the lack of vocations. And the church must solve this problem,” the pope said. He expressed the view that an increase in prayer and outreach to youth could change the situation. He added that youths are the ones who lose most in many modern societies because of a lack of employment. “Then we must determine what tasks they could undertake, for example in remote communities,” he said. Pope Francis spoke about the commission studying women deacons and the exact roles they played in early church history. The commission is an ongoing project, he said, dedicated to open dialogue. “It was about exploring the subject, and not to open a door” on automatic approval, Pope Francis said of the commission. Among other areas of discussion was his relationship with Cardinal Raymond L. Burke, current patron of the Order of Malta, who is often viewed as one of Pope Francis’ most vocal critics. The pope denied rumors that Cardinal Burke was sent to Guam as a form of “exile” to be the presiding judge in a church trial investigating allegations of sexual abuse leveled against Archbishop Anthony S. Apuron of Agana. “I do not regard Cardinal Burke as an adversary,” the pope said. The pope was asked about the recent change of leadership at the Knights of Malta, in which Fra Matthew Festing, the former grand master, resigned at the pope’s request, after the order’s forced ouster of its grand chancellor, Albrecht Freiherr von Boeselager. While Cardinal Burke remained the order’s patron, the pope appointed Archbishop Angelo Becciu as his special delegate and sole spokesman to the Knights of Malta. When asked by Die Zeit about the rise of populism — particularly from those on the right of the political spectrum — the pope said he uses the word “populism” in the sense defined in Latin America as way “to use the people” to gain power. Recalling Germany’s history, the pope said Adolf Hitler rose to power promising to return Germany to its former glory after a serious economic crisis. “He convinced the people that he could. Populism always needs a messiah and a justification: ‘We preserve the identity of the people! '” the pope said. “Great politicians,” such as Germany’s first post-war chancellor, Konrad Adenauer and former French Prime Minister Robert Schuman, envisioned a Europe united in brotherhood, and that “had nothing to do with populism,” he said. “These men had the gift of serving their country without placing themselves in the center, and this made them great leaders. They did not have to be a messiah. Populism is evil and ends badly, as the past century has shown,” Pope Francis said. Pope Francis also discussed his personal faith experiences and beliefs about God’s mercy, saying that an individual’s faith grows throughout a lifetime. “Faith is a gift. It will give itself,” said the pope, adding that faith is to be prayed for. He said he does not like to be idealized by others, saying that idealizing a person leads to aggression. He said that he views himself as a normal person trying to do his best. He also added that he does not become angry at people who disagree with his opinions and believes that diverse opinions are good for the world. “Since I was elected pope, I have never lost my peace. I can understand if some people do not like my own way of going about things, and that is completely normal,” said Pope Francis. “Everyone may have their own opinion. That is legitimate and humane and enriching,” he said. In response to a question, Pope Francis said he is not able to visit Germany this year for the 500th anniversary of the Reformation, despite an invitation from Chancellor Angela Merkel. “The appointment calendar is very full this year,” he told Die Zeit. Asked whether he would visit Russia, China, India or other countries perhaps this year, Pope Francis replied: “To Russia I cannot travel, because then I would also have to travel to Ukraine. Contributing to this story were Zita Fletcher in Germany and Carol Glatz in Rome.